February 11, 2016 / LBD "Nytetrayn"
Kitamura discusses Rockman (artist's rendition). It's been a little while since we last heard anything Blue from Shmuplations' Japanese interview translations. Previously, we've been privy to seeing what the Rockman 9 development team had to say about their project and what hell the development of Rockman X was, but now we may have their greatest Rockman-related interview to date as fan favorite manga artist/writer Hitoshi Ariga sits down with none other than Akira "A.K." Kitamura. Some of you might be asking "who?" As it turns out, while not entirely undeserved, the role of Keiji Inafune in the creation of Rockman has been inflated a bit over the years, a fact he himself acknowledges as people often see him as the creator or "father" of the Blue Bomber. However, it was Kitamura who was the planner for the two original games that would set the stage for years to come -- as well as designing the character of Rockman himself! Oh, and the whole Astro Boy thing? In case it wasn't clear by now, that was but one of many influences on Rockman, with Ninja Captor arguably being just as significant. Kitamura: When I first created the world for Mega Man, but before I knew what the gameplay system would be—originally there was no Mega Man, no Roll, no Dr. Light. Cut Man was the hero. (laughs) I imagined a game where you’d use those scissors on his head to cut down enemies and other obstacles as you progressed through the stage. Ariga: Cut Man was your first idea as the player character? That’s a surprise. Though that does sound like a game I would have liked to try. (laughs) I can’t think of another game with a design like that. You’d know right away just by looking at Cut Man what you’re supposed to do! 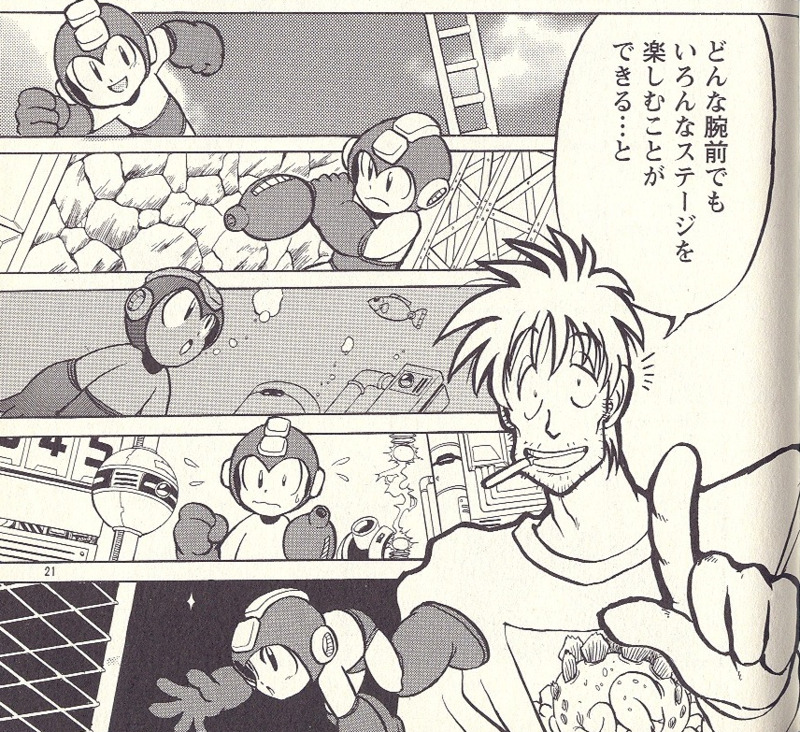 Kitamura: After that, more and more robot masters started coming to me. I gave them all a general personality. I got a lot of hints for the gameplay out of their profiles. As one might expect, given the subject, the interview is a treasure trove of information and history that anyone who calls themselves a fan of Rockman/Mega Man should probably at least look over once, and you can do just that by clicking here!